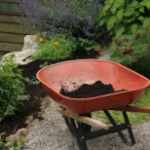 Our North Attleboro Landscape company doesn’t do a lot of Landscape Construction work, but when we do indulge for a client and commit to a soft-scape I am usually on a mission to entirely renovate the planting beds. Along with re-sculpting the bed lines I am making sure that I include a plan for amending the existing soil. After attending New England Grows this past week I took away a great Landscape tip from James Urban, FASLA when he spoke about planting plans. Tip: include a soil plan in your Landscape proposals. This idea really resonated with me. I continually encounter difficult soil conditions. Whether it is new construction where you are left to work with minimal topsoil on top of compacted gravel or poor soil that has been neglected and lifeless. I have instilled in my staff the importance of using soil amendments and will be including this into our future Landscape proposals. I think looking at this issue more globally and breaking out this segment could act as a education to the root of a lot our North Attleboro Lawn and Landscape issues.